This article is about the Akkadian king. For other historical figures of the same name, see Naram-Suen (disambiguation). Naram-Sin also transcribed Narām-Sîn or Naram-Suen (Akkadian: 𒀭𒈾𒊏𒄠𒀭𒂗𒍪: DNa-ra-am DSîn, meaning "Beloved of the Moon God Sîn", the "𒀭" being a silent honorific for "Divine"), was a ruler of the Akkadian Empire, who reigned c. 2254–2218 BC, and was the third successor and grandson of King Sargon of Akkad. Under Naram-Sin the empire reached its maximum strength. He was the first Mesopotamian king known to have claimed divinity for himself, taking the title "God of Akkad", and the first to claim the title "King of the Four Quarters, King of the Universe". Naram-Sin was born as a son of Manishtushu. He was thus a nephew of King Rimush and grandson of Sargon and Tashlultum. Naram-Sin's aunt was the High Priestess En-hedu-ana. Possible relief Naram-Sin at Darband-i-Gawr, celabrating his victory over Lullubi king Satuni. Qaradagh Mountain, Sulaymaniyah, Iraqi Kurdistan. Who said "I would lie down in Akkad" found not a good sleeping place." These Gutian raids were indeed devastating, but it is unknown how badly they affected Sumer. Naram-Sin may have passed on his empire to his son Shar-Kali-Sharri more or less intact upon his death in c. 2219 BC, or he may have passed on little more than Akkad itself. The Gutians remained there for over 100 years before being replaced by the Ur III state as the dominant political power. 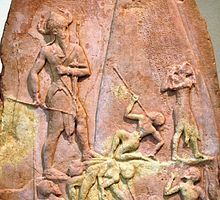 Naram-Sin's Victory Stele depicts him as a god-king (symbolized by his horned helmet) climbing a mountain above his soldiers, and his enemies, the defeated Lullubi led by their king Satuni. Although the stele was broken off at the top when it was stolen and carried off by the Elamite forces of Shutruk-Nakhunte, it still strikingly reveals the pride, glory, and divinity of Naram-Sin. The stele seems to break from tradition by using successive diagonal tiers to communicate the story to viewers, however the more traditional horizontal frames are visible on smaller broken pieces. It is six feet and seven inches tall, and made from pink limestone. The stele was found at Susa, and is now in the Louvre Museum. 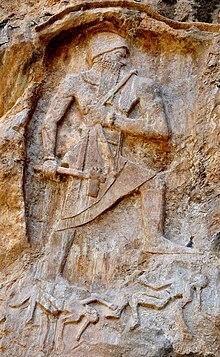 A similar bas-relief depicting Naram-Sin was found a few miles north-east of Diarbekr, at Pir Hüseyin. Naram-Sin stele, inscription of Naram-Sin in the Akkadian language. The name Naram-Sin (𒀭𒈾𒊏𒄠𒀭𒂗𒍪) appears vertically in the upper right box. Naram-Sin the powerful . . . . Sidur and Sutuni, princes of the Lulubi, gathered together and they made war against me. —  Akkadian inscription of Naram-Sin. The second inscription, to the right over the mountainous cone, is in Elamite and was written about 1000 years later by king Shutruk-Nahhunte, who stole the stele and brought it to Elam. 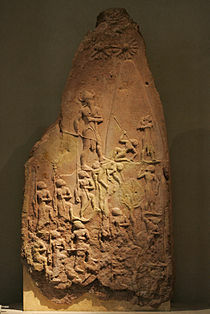 Stele of the Akkadian king Naram-Sin. The "-ra-am" and "-sin" parts of the name "Naram-Sin" appear in the broken top right corner of the inscription, traditionally reserved for the name of the ruler. Istanbul Archaeological Museum. The name "Naram-Sin" in cuneiform on an inscription. The star symbol "𒀭" is a silent honorific for "Divine", Sîn (Moon God) is specially written with the characters "EN-ZU" (𒂗𒍪). Among the known sons of Naram-Sin were his successor Shar-Kali-Sharri, Nabi-Ulmash, who was governor of Tutub, and a Ukin-Ulmash. Excavations at Tell Mozan (ancient Urkesh) brought to light a sealing of Tar'am-Agade, a previously unknown daughter of Naram-Sin, who was possibly married to an unidentified endan (ruler) of Urkesh. ^ Bromiley, Geoffrey W. (1995). The International Standard Bible Encyclopedia. Wm. B. Eerdmans Publishing. p. 186. ISBN 9780802837851. ^ Roux, Georges (1995). La Mésopotamie. Essai d'histoire politique, économique et culturelle. Le Seuil. p. 141. ISBN 9782021291636. ^ Samuel Noah Kramer (2010-09-17). The Sumerians: Their History, Culture, and Character. University of Chicago Press. ISBN 0 226 45238 7. ^ Julian Reade (2000). Mesopotamia. British Museum Press. pp. 67–68. ISBN 0-7141-2181-9. OCLC 43501084. ^ Louvre ( Arts and Architecture). Köln: Könemann. ISBN 3-8331-1943-8. ^ Babylonian & Oriental Record. 1895. p. 27. ^ Mieroop, Marc Van De (2015). A History of the Ancient Near East, ca. 3000-323 BC. John Wiley & Sons. p. 199. ISBN 9781118718230. ^ Buccellati, Giorgio; Kelly-Buccellati, Marilyn (2002). "Tar'am-Agade, Daughter of Naram-Sin, at Urkesh" (PDF). In Al-Gailani Werr, Lamia (ed.). Of Pots and Plans. Papers on the Archaeology and History of Mesopotamia and Syria presented to David Oates in Honour of his 75th Birthday. London: Nabu. pp. 11–31. ISBN 1897750625. Archived from the original (PDF) on 2 April 2015. Retrieved 18 March 2015. H.W.F. Saggs, The Babylonians, Fourth Printing, 1988, Macmillan Publishers Ltd.
J. P. Naab, E. Unger, Die Entdeckung der Stele des Naram-Sin in Pir Hüseyin, Istanbul Asariatika Nesriyati XII (1934). Wikimedia Commons has media related to Naram-Suen. This page was last edited on 31 March 2019, at 10:22 (UTC).